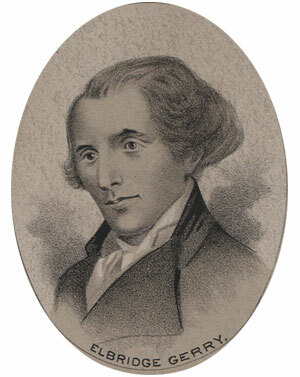 Elbridge Gerry was born in Marblehead, Massachusetts, on July 17, 1744. He studied at Harvard to be a merchant, graduating in 1762. He was elected to the Massachusetts Legislature in 1773 and was selected to attend the Provincial Congress in 1774. He was then appointed to the Continental Congress, where he was engaged in committee work on commercial and naval concerns. He attended the Constitutional Convention in 1798 but was opposed to the new Federal Constitution, refusing to sign it. He was elected to the first two Congresses from Massachusetts and, in 1797, was one of several envoys sent to France. He was elected governor of Massachusetts in 1810 and 1811. He was much criticized for redistricting the state to the advantage of his own party (Democratic-Republican). That incident was the source of the term gerrymandering. In 1812 he was elected Vice President of the United States. He died in office, on November 23, 1814, at the age of 70.